Looking out the window, Sanjeewa Alwis could easily see the dredging vessels in the distance, strenuously pumping the yellow sea sand into the air, which resembles a bridge built between Colombo's beautiful clouds and the construction site of Colombo Port City. Such a sight reminded Sanjeewa of many fond memories, especially that of participating in the Belt and Road Forum for International Cooperation held in Beijing last year. "I still vividly remember that in the 'Enhance People-to-People Bonds' parallel session of the Belt and Road Forum, I shared my story of representing the Port City Project to ask (the) Sri Lankan government for a backup water supply inlet," Sanjeewa told Xinhua in his office at the construction site. Sanjeewa explained it was not easy to push forward the project at that time. However, one year later, with the mega project gaining increasing popularity in the island country, the Port City has already begun to take shape, under the joint efforts of the Sri Lankan and Chinese sides. Co-developed by the Sri Lankan government and China's CHEC Port City Colombo (Pvt) Ltd, the Port City is designed as a financial, residential and entertainment hub in the Indian Ocean region. Its construction and development are expected to be completed in 25 years. As the Mechanical, Electrical and Plumbing Manager of the project, Sanjeewa proudly introduced the construction progress of the Port City. He said, out of the total planed 269 hectares (2.69 square kilometers), more than 220 hectares (2.2 square kilometers) of land had been reclaimed from the sea so far. With land reclamation almost approaching the completion, infrastructural construction is set to begin next month. "People gradually realize that the future of Colombo resides in the Port City, therefore they support it very much. The project is steadily progressing now," Sanjeewa said. The weather in Colombo turns capricious in May. Without warning, dark clouds blanket the sky, foreboding heavy rainfall. However, the construction site remained as busy as usual, with low rumble of trucks endlessly ferrying quarried stones. The monsoon climate indeed brought many difficulties to the construction. Last November, a cyclone hit Colombo, and damaged parts of the Port City's breakwater which was under construction. 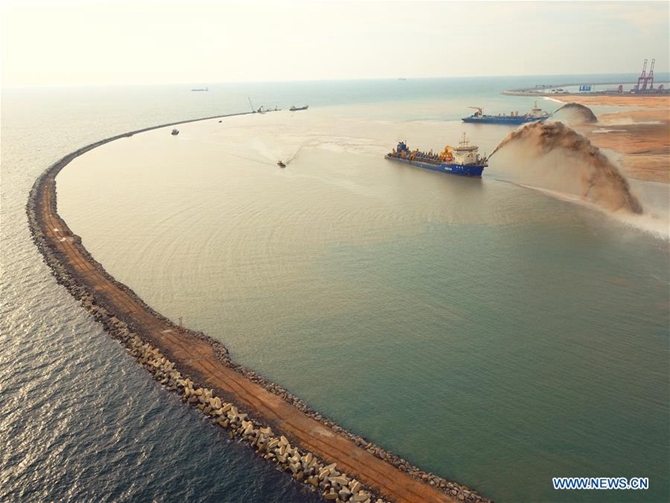 "At that time, the contractors of the project pulled out all the stops to make up (for) the losses caused by the cyclone," Wang Hao, assistant of general manager from CHEC Port City Colombo (Pvt) Ltd told Xinhua. Wang said, despite unfavorable weather conditions, everything was on schedule now. More than 2.4 kilometers of the breakwater has been built and over 60 percent of the overall construction work of the project has been completed. The Port City has also begun to prepare for foreign investments. In April, the Sri Lankan government approved the Port City's Development Control Regulations (DCR), which enables the land of the project to be sold to investors. According to the Planning Department of CHEC Port City Colombo (Pvt) Ltd, the DCR provides details on the use of every area of the Port City's land, as well as the regulations to be observed by developers, investors and all other development partners of the project. What's more, just close to the entrance of the Port City, a modern building which will function as the sales center has been erected recently. "We have been to Southeast Asia, the Middle East and many regions in the world to attract investments for the Port City. A dozen of international enterprises have expressed interests in the project," said Liang Thow Ming, chief sales and marketing officer from CHEC Port City Colombo (Pvt) Ltd.
Liang added, several Memorandum of Understandings are expected to be signed later this year between the Port City and the companies willing to invest here. The fast development of the Port City in the past year gives Sanjeewa a deeper understanding of the Belt and Road Initiative proposed by China. In order to better cooperate within the framework of the initiative, "we need to understand each other first, and bond our hearts together. Luckily, Sri Lanka and China have achieved that in the project of the Port City. I believe in the future we will build the city into a pearl of the Indian Ocean," Sanjeewa said.